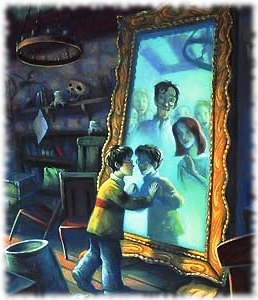 This post is a request by long time blog reader The Ikarians, who left me a voicemail comment a little while back requesting the story of how JK Rowling wrote the first Harry Potter book. When JK Rowling first stepped foot on to the set of the original Harry Potter movie she was in total shock. 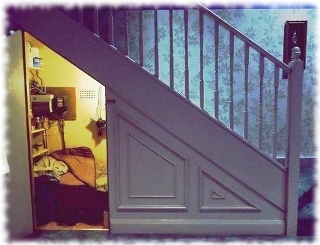 Up until that day she had never realized the house Harry lived in was the exact same layout as the house she herself had grown up in, with cabinet under the stairs and everything. The movie makers had built the set of the house by what was described in the book, bringing to life a part of her childhood that she didn’t even know she’d written into the story. Luckily she never had to sleep in a cabinet under the stairs or anything like that, but her parents were definitely very open about how they would have preferred another child. Before she was born they were expecting a boy and had even picked out a special name for him, but surprise…they got her instead. She was Joanne instead of the ‘Simon John’ that they had wanted and she never forgot it. This kind of a childhood left her on very shaky ground, and even though she was often able to hide it from others by pretending to be strong and confident (even to the point of being bossy and coming off as a know-it-all) inside she felt unsure of herself and afraid to be who she really was. 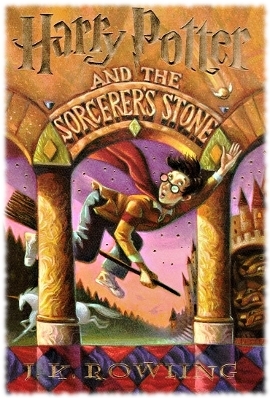 The story of Harry Potter first came into JK Rowling’s life when was in her twenties. She was stuck in a train station waiting on a train that was supposed to be going to London, but for the time being was going absolutely nowhere. It was hard for her to mind too much though, as she had always loved trains and train stations. Trains were a deep part of the folklore of her life and she had grown up hearing romantic tales of how her parents met and fell in love at King’s Cross train station. All of a sudden while she was sitting there on the train a vision of a boy popped into her mind, she could see him and his story very clearly, here was this scrawny little boy who didn’t know he was a wizard and was setting off toward a far off wizarding school. The world of Harry Potter came flooding into her mind with all it’s little details like how exactly the wizarding school was run and the various characters who had adventures there. But there was one major problem: she didn’t have a pen. Frantically digging through her bag she first searched for a pen or pencil, but then eventually for any kind of writing instrument at all that she could use to start bringing this story to life on paper. Anything would do, an eyeliner even, but there was nothing. And so she had to sit there all during the wait and the train ride just thinking about the world of Harry Potter. As soon as she got home she started writing and writing. She had always wanted to be a writer ever since she wrote her first book, called ‘Rabbit’ at around six years old. She loved books a lot and she loved writing even more and had secretly harbored the dream of becoming a writer someday, but was riddled with self-doubt. When her childhood best friend Sean Harris (who later became the inspiration for Ron Weasley) had found out about her dream he encouraged her to keep writing and not to give up. And indeed over the years she had always kept scribbling away longhand on whatever paper was around but she’d never truly commited herself to the goal of becoming published. And now here was the story of Harry Potter calling out to her, a story that her heart leapt with joy at the thought of writing. 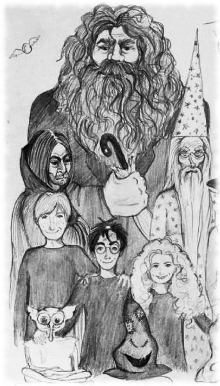 She even started to make very detailed things like diagrams of the lives of every student of Hogwarts and drawings of the characters so she could ‘know what they looked like’. But despite this world that was coming alive on the paper in front of her she still felt unsure of herself, she was afraid to dedicate herself to writing a book about child wizards going to wizarding school, even if it was her dream. Just a few months after JK Rowling put her first Harry Potter ideas to paper her mother died after a long battle with multiple sclerosis. JK Rowling wasn’t close to her father, in fact in many ways she had spent her life in fear of him, but things with her mother were different and the loss left her utterly devastated. “Her death is on virtually every other page of the Harry Potter books. At least half of Harry’s journey is a journey to deal with death in it’s many forms, what it does to the living, what it means to die. What survives death. After the trauma of losing her mother she made big changes in her life. The book was put to the side and she moved to Portugal to work as a teacher, got married, and had a daughter. This was a more conventional route, much safer than wagering everything on pouring herself into trying to get a book published. However, the marriage rapidly fell apart. She had spent her life afraid of her father and now she’d ended up marrying a man much like him. The marriage lasted a mere thirteen months and a day, and soon she was on a desperate plane ride back to the UK with no money and a new baby to take care of. To put things bluntly, her life was now in shreds and there was nowhere to hide from it. She was now literally as poor as you could get in the UK without being homeless. It wasn’t long before she sank into the darkest depression of her life. 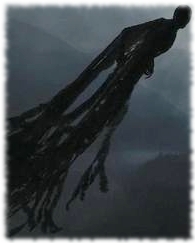 For most people the Dementors are just spooky characters in a book, but to her they came from real terrors, a deep unrelenting depression and haunting thoughts of suicide. JK Rowling was terrified about what growing up around a extremely depressed mother would do to her daughter. Or worse, growing up around no mother at all. So she sought out medical help for her depression and started attending therapy sessions under the care of a doctor. She threw herself into putting the Harry Potter story on paper no matter what, even if in the end it got rejected by every single publisher and never got published. This was her dream, this was who she was…and really what did she have to lose? During this time her daughter had a hard time falling asleep and the best way to get her to rest was to take her around in a stroller each day until she dozed off. 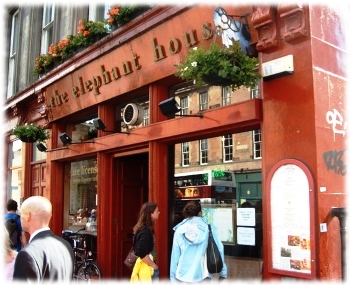 After these walks JK Rowling would stop into a local coffee shop called The Elephant House, sit at a particular out of the way table, and write and write. And so in this way Harry Potter and the Sorcerer’s Stone was written out longhand over many afternoons in a coffee shop and then later typed up on an old typewriter. 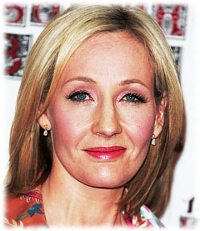 Through the writing of Harry Potter And The Sorcerer’s Stone (er, Philosopher’s Stone) she was not only able to fulfill her dream of becoming a published author but she also experienced an unexpected side effect… becoming the richest author in the entire world. Her love for her family, of writing, and of the story of Harry Potter helped her overcome the hardships of life and ultimately gave her what she needed to succeed. JK Rowling had come a long way from the girl who so desperately tried to hide who she was, who sitting in her childhood home would have never dared to dream that one day she’d actually be walking through the set of a movie …a movie based on a book written by Joanne ‘K’ Rowling. I need in first instance, to thank you Anita for such a beautiful work, to me this post has a particular meaning, now even more because I´m getting to read the whole story of JKR, it´s shocking the feeling I get when I see that some parts of her life and the obstacles she faced both in the exterior and interior world, are not alien to most of us. Growing up, family, depression, death, courage to make true her dreams. I must say this particular part of the story, the fear she lived with, touches me deeply. Someone said once, Heroes are not extraordinary persons, Heroes are ordinary persons who do extraordinary things. All tis magic world of Harry Potter are an attempt to show the heroism that saved her life, what makes you keep fighting against the obstacle, the hard desicions taken to keep going,…..in most of us, these results come in diff ways,…. for her it was Harry Potter. Yay I’m glad you liked the post! I thought your request was a great one and I had a fun time looking into how JK Rowling came to write Harry Potter. I’m happy that you liked the writing too, that was fun as well but maybe not quite as much fun as the first part :D.
The thing about Harry’s house being the same as her childhood one was especially interesting imo…what a shock that must have been for her. If it was me I would be wondering what else had made it into the books that I didn’t know about yet LOL. But I guess it’s only natural for books to be a reflection of the author’s own history in one way or another, even if they’re not as obvious as JK Rowling putting Harry Potter under the stairs of her childhood home. My only regret about this post is that there was such a long gap between getting the request and publishing it, but better late than never ;). Oh and if you were wondering she did get married again and is happily married and has had a couple more children as well. So her life is on the upswing on all fronts, not only is she a multi-millionaire (used to be billionaire but she gave away so much money to charity that she’s back to the millions…great problem to have lol) but she has a happy marriage as well. That ought to keep the Dementors away forever. You know what’s crazy…JK Rowling actually does give money to people who write her. She doesn’t give it away to everyone obviously, but while watching a certain interview of her I was surprised to hear her mention that even though she gets something like 1500 letters a week she (er, or assistants probably lol) pays attention to them and will consider requests for money. She said that at first the giving away of money was a sort of scattered process but now she’s opened up a charitable trust to help her decide who to donate money to, with an emphasis on children’s charities if I remember right. So no wonder she went from billionaire to ‘only’ multimillionaire, she’s definitely someone who hasn’t forgotten what it’s like to be poor and disadvantaged. wow! I had to read all over again! It´s just so incredible this story that i just found myself trying to feel what she felt, I think its a liberating feeling to overcome all the tragedy in her life! :) Yeah I think there’s a lot of great lessons to be learned from what she went through. It really hit me how real the rock bottom of that one part of her life was when I saw an certain interview someone did with her… the camera crew took her back to the apartment where she was desperately poor and had written the first Harry Potter book. She hadn’t been back to that apartment in a long time and after looking around for a minute or two she just burst into tears. She said she was remembering what a hard and desperate time that was for her, she said something like how ‘everybody knows about the fairytale ending now, but back then I didn’t know if things would turn out okay at all’. It was very heartbreaking! And then it took almost a year for the book to find a publisher, she just kept getting one rejection after another…that must have been even more depressing for her. But she never gave up, thank goodness. Aw thanks, that would be quite surreal …not that I’d be complaining or anything at that point LOL. In the meantime I’m really happy that you liked this story, thanks for stopping by :). 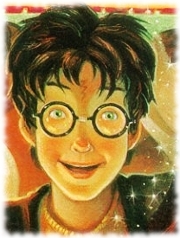 Is it true, JKR is going to write a continues book of Harry Potter? That’s a good question. So the answer is both No and Yes, JK Rowling said that she’s not going to write any more books with Harry Potter as the main character but is considering doing new books set in the same world of magic that Harry lives in. She also said that she might even do a prequel or a sequel to the story of Harry Potter, like tell the story of Lilly and James Potter or of the adventures of Harry’s kids. The only hope for a new novel with Harry as the main character would be her adding more details to the same books that have already been released, she said she might do that in the future. JK Rowling did release a new book last week though it’s called The Casual Vacancy and it’s about teenagers but she says it’s meant as a book for adults rather than for kids like the Harry Potter books were. Hope that helps! Let me know if you have any other ?’s. I’ve read some reviews and magazine articles about JK Rawlings but none have been as researched and well presented as yours. I’m a newbie here but I’m looking forward to more of your work. By the by, I don’t have a URL. I only have a blog of sorts that I use as a holding tank for unruly posts about….stuff. Hey great to hear from you and I’m really happy that you liked the story :). Looking forward to checking out your blog and reading some of your writing! I´m Reading this Post again today and have to tell WOW!!! It made my day! In many ways I feel my life as she described without having exactly the life she has when kid but this story talks to me in a different level so personal. Once again Thank you Anita For posting this! I’m really happy that you came back to this story then :). It’s amazing isn’t it how some stories can speak so deeply to your own experience? Whenever I come across a story that does that for me it always changes my life for the better, even if it’s just a little bit. This is an amazing story!!! I love it!!! Great job!!! Have you considered publishing it? You might actually make a profit! I am a professional publisher and think you might have a career in writing! Thanks, I’m really happy that you liked the story. I’m not interested in publishing this story at the moment but I definitely appreciate the offer :).